It's not everyday that you write a book. Well, unless you're James Patterson and you have a staff of 50 writers working for you. Alas, I have a staff of one. You may not be aware that I recently wrote a book. Technically I co-authored it with a bunch of other people. And technically I only wrote 1.37% of it. But I was proud enough of it to give my free author's copy to my mother for a (no-cost-to-me-but-it-looked-like-I-spent-at-least-$15) Christmas gift. 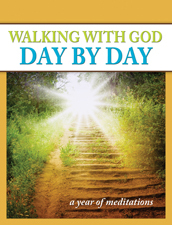 Walking With God Day By Day is a series of 365 brief meditations for the whole year. I wrote five of them which means that if you'd like me to personally sign your copy I can only, in good faith, write 1.37% of my name. In the spirit of giving, I guess I could round up and give you the whole "T." (At the bottom of this post you'll find one of the five). Even though the New Year has already begun, you don't have to feel bad about getting a late start since my first meditation doesn't appear until sometime in March. In fact, the publisher has offered readers of Clergy Family Confidential a 25% discount! Yes, my archnemesis, Scott Gunn, at Forward Movement has extended this generous offer. Act now and he'll throw in a gratuitous blog post about the book as well. Seriously, if you click on the book title link above and enter code AUTH25 you'll get a 25% discount on the printed book. You can also use the code if you call to place your order at 800-543-1813. There's one trick on the website according to Scott, "Alas, our antediluvian website won't show the discount right when they order, but we'll take it off when we process the order." It's also available for Kindle and Nook. No discount but it's already cheap there. There are a number of great authors who participated in this project including Lent Madness "Celebrity Bloggers" Heidi Shott and Penny Nash (stay tuned for Lent Madness 2012). Scott wrote a few reflections as did a bunch of talented writers I've never heard of (I'm sure the feeling is mutual). If you do order it, I know you'll enjoy it and get a lot out of it. And if not, complain to Scott. Thought, thankfully, Jesus has never laid claim to a purple handbag. Purple? Are you sure you didn't come across a very elderly American bishop?